Two Hoots Press, 9780997506907, 260pp. Retrace Western North Carolina's cultural and natural history with one of its most beloved storytellers and folklorists, John Parris. Repackaged with an updated cover and back in print for the first time in decades, the Two Hoots Press Heritage Edition includes the complete original text and illustrations of this southern classic. 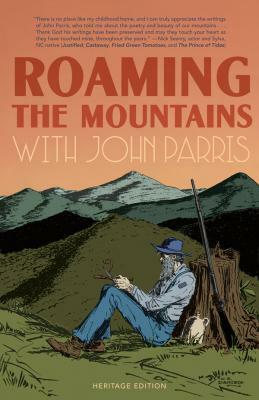 For almost four decades, John Parris' brief yet illuminating non-fiction essays comprised his popular Asheville-Citizen-Times column, "Roaming the Mountains." When a selection of Parris' columns were first published as this book in 1955, it was an instant regional classic. Parris writes with the crispness of Hemingway and the grace of Thomas Wolfe. Indeed, he was a war correspondent like Hemingway and a decorated hero for his work with the Belgian underground during World War II. But the enduring legacy of John Parris is his work to document the culture and lives of Appalachian people. He was the last writer to capture many of the first person accounts recorded in this book. With every word, Parris links past to present in loving tribute to his Western North Carolina home, its mountains, and its people.